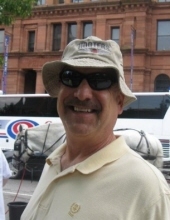 Trombetta, Michael F., 66, of Egg Harbor Twp., was born February 22, 1952 in Philadelphia PA. Michael was unexpectedly called home to be with the Lord early morning, January 23 2019. He is survived by his three children, Michele, Umberto and Danielle; as well as his eight loving grandchildren. He was a beloved father grandfather uncle and friend to many. Michael was a proud US Army veteran of the Vietnam War and active member of the VFW in Absecon where he especially was honored to be a member of their honor guard. He will be truly missed by all who knew him. To celebrate his life, a visitation will be 8:45AM to 10:45AM on Tuesday, January 29, 2019 at St. Elizabeth Ann Seton Church, 591 New Jersey Ave., Absecon. A mass of Christian Burial will follow at 11AM. Burial will be private. Services are under the direction of Parsels Funeral Home, Absecon. For online condolences or directions, please visit www.parselsfh.com. To send flowers or a remembrance gift to the family of Michael F. Trombetta, please visit our Tribute Store. "Email Address" would like to share the life celebration of Michael F. Trombetta. Click on the "link" to go to share a favorite memory or leave a condolence message for the family.